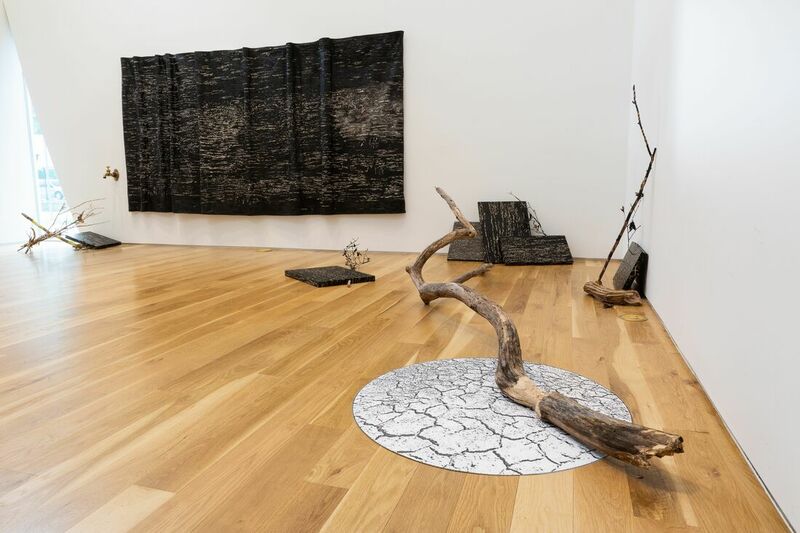 Furious Flow, Drought and Fire, 2019, mixed media: acrylic paint on cloth, found objects including post-Harvey debris (plastic bags, aluminum can, branches,) painted wood panels, tumbleweed and tree limbs, audio components: sounds of flowing water, trickling water, dribbling water to the sound of a single drop and also of crackling fire,) vintage brass hardware, mediated photograph and a video with audio projection. Variable dimensions. 20ft W X 20 ft L X 15ft H.